This week while volunteering as a naturalist in Elk/Beaver Lake Nature Centre, I met a family that is having a Puffin Summer. Every day they go to Puffin Cam and then look up a new fact about puffins on the internet. It used to be that you had to go to the library and find a book in order to learn about nature. How else could you identify what kind of butterfly you saw or what plant is growing behind your grandparents' woodshed? Now there are terrific online resources for people who love learning about the biological sciences! Of particular interest to Canadians is the Canadian Biodiversity Information Facility. The CBIF operates in support of the Global Biodiversity Facility, which has information on over a million and a half species. Integrated Taxonomic Information System (ITIS) is a catalogue of common and scientific names and their synonyms that will eventually include all species found in Canada, the United States and Mexico. 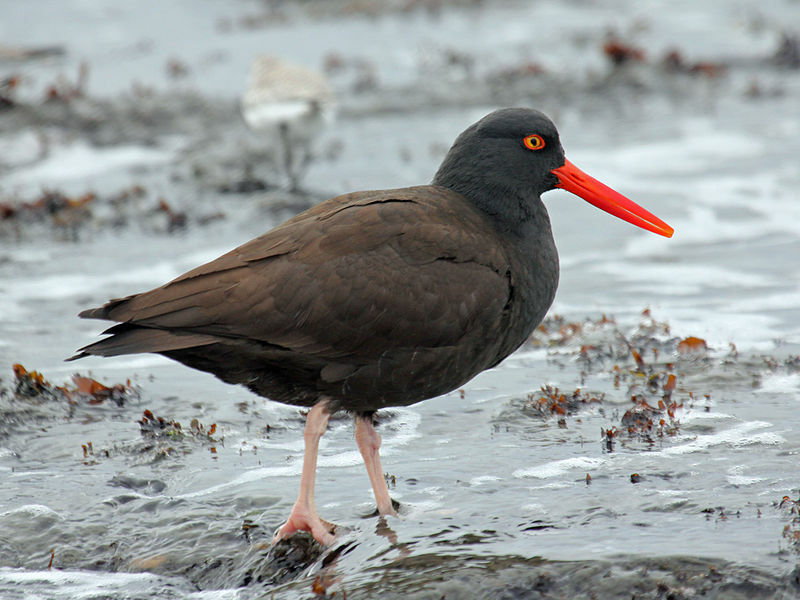 I clicked on Search ITIS, then entered the common name "oystercatcher" into their simple form, and it came up with links to pages on many kinds of oystercatcher birds, and the scientific names for each kind. Here's a photo of this striking bird, with its bright eyes and bill and pink feet. For the other two tools, you'll need the species name for the living thing you want to find. Species Access Network is the Canadian component of a global project to provide Internet access to information associated with the billions of specimens housed in the world's natural history collections.Users can search these collections by species name, source collection, collector, or location. Species Bank includes a collection of electronic resources that provide detailed information to support the identification of Canadian species including descriptive information, photographs, distribution maps, and more. Now that it's summer, I hope you'll enjoy being out in the wide world, finding plants and animals in towns and in wild places. When you come back indoors, the CBIF website is a good place to learn about what you've found -- but no computer can substitute for breathing the same air as our animal and plant neighbours. In the long and complex story of evolution, organisms emerge and then disappear, never to be seen again. I understand and accept that. Honest. But, fair or not, I regret the loss of some organisms more than others. I admit it. I miss giant ground sloths. Don’t get me wrong. I’m not old enough to have met a giant ground sloth face to face. None of us is. The last lingering remnants of a great bunch of animals perished about 5,000 years ago, probably on a small Caribbean island. 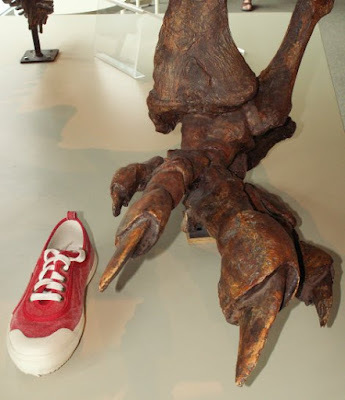 Fossil foot of a Jefferson's ground sloth beside my shoe. C. Eamer photo. While they were here, though, they were amazing. And really, really big. Well, some of them were big. Some species were as small as house-cats, but the largest ground sloths – Megatherium and Eremotherium – were the size of elephants. Hairy elephants, with thick hides dotted with bony plates, claws the size of bananas, and a propensity to stand up on their hind legs and maul substantial trees. If it’s any comfort, they were vegetarian. Mostly. Some scientists think that Megatherium, at least, might have used those giant claws to grab a bite of meat to go with the veggies, especially when climate change dried the local landscape and thinned out the forests it relied on. Greg McDonald, senior curator of natural history for the US National Park Service, is another sloth enthusiast. He recently delivered a talk on ground sloths, via Skype, to an appreciative audience in Whitehorse, Yukon. The Yukon is, surprisingly, ground sloth territory. It’s actually where I first met a ground sloth – if not face to face, then at least face to skull. 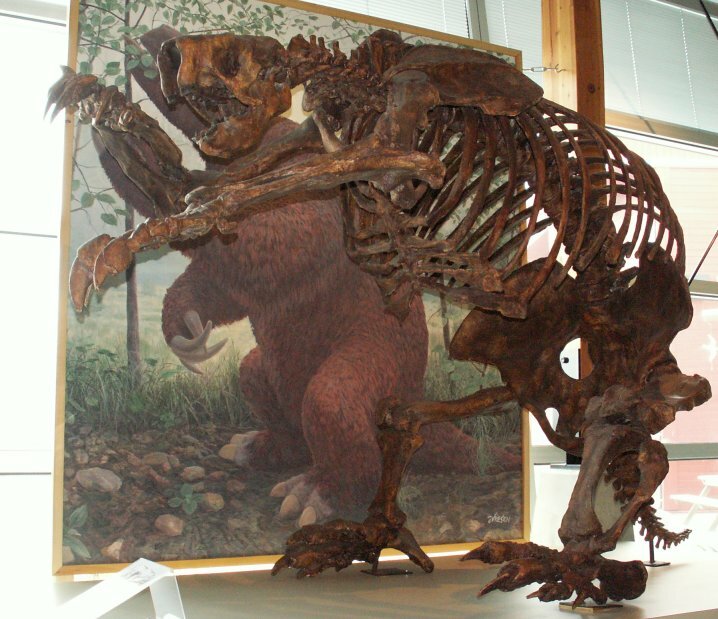 It was a Jefferson ground sloth, a member of the genus Megalonyx, and its ox-sized skeleton looms over visitors to the Beringia Interpretive Centre in Whitehorse. For hundreds of thousands of years, Megalonyx ranged from southern Mexico to as far as Alaska and the northern Yukon. Megalonyx was unique, McDonald said, in being a wholly North American sloth. Although its ancestors came from South America, Megalonyx itself evolved in North America and never spread south of Mexico. A sloth skeleton towers over visitors to the Beringia Interpretive Centre. C. Eamer photo. That made it a late-comer in the sloth world. Like many other strange and wonderful mammals, sloths evolved in South America, in splendid isolation. The giant Megatherium roamed the ancient forests of South America in those days. And it had a curious assortment of cousins: anteaters, giant armadillos, and a bizarre creature called a glyptodont that looked like an ambulatory bone igloo. They all belonged to a group called Xenarthrans, which evolved exclusively in South America. That was a momentous time in evolution, said McDonald. It’s called GABI: the Great American Biotic Interchange. Released from isolation, the Xenarthrans drifted northward, along with other distinctly South American animals, such as giant flightless birds with the hooked beaks of meat-eaters and the ancestor of the humble porcupine. At the same time, animals that had evolved in North America moved southward, including hunting cats with dagger-like fangs and those members of the camel family that became South America’s llamas and alpacas. Ground sloths spread and adapted and changed on both continents for several more millions of years. They even took to the sea. Marine deposits in southern Peru have turned up a wealth of ancient fossil whales, seals, and sea lions – and entire skeletons of giant sloths. The sloth skeletons show clear evidence of adaptation to an aquatic environment. McDonald said it appears that the aquatic sloths were evolving into animals that went into the sea to eat sea grasses. Like the whales, they were reversing the classic sea-to-land journey of most mammals. sloths didn’t survive the great megafauna die-off at the end of the last glaciation, about 12,000 years ago. A few small ground sloths lingered on isolated Caribbean islands, where 5,000-year-old sloth bones have been found in caves. Today, the much-diminished sloth tribe has been reduced to the endangered tree sloths – a mere six species in two genera – eking out an existence in the shrinking rainforests of South and Central America. The giants are gone. And, even though I never shared the world with them, I miss them. In fact, they inspired me to write my first kids' science book, Super Crocs & Monster Wings: Modern Animals' Ancient Past. A recent trip to Ireland reinforced for me the importance of learning Latin names of common plants. Of course I recognized my old friend Taraxacum sighted here at Mellifont Abbey in County Louth — and in numerous fields. 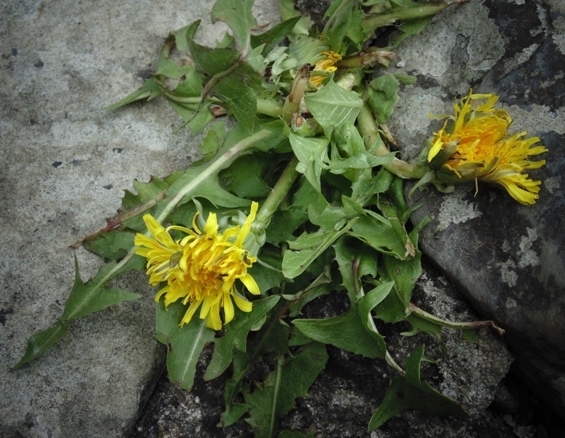 Although we in North America don't think of dandelions as an invasive species, they are native to Eurasia and have been spread around the world by settlers who likely planted the seeds to make use of the plant's many medicinal and nutritional uses. I also knew that this bird fishing in the waters outside Ashford Castle in County Mayo had to be a member of the heron family. 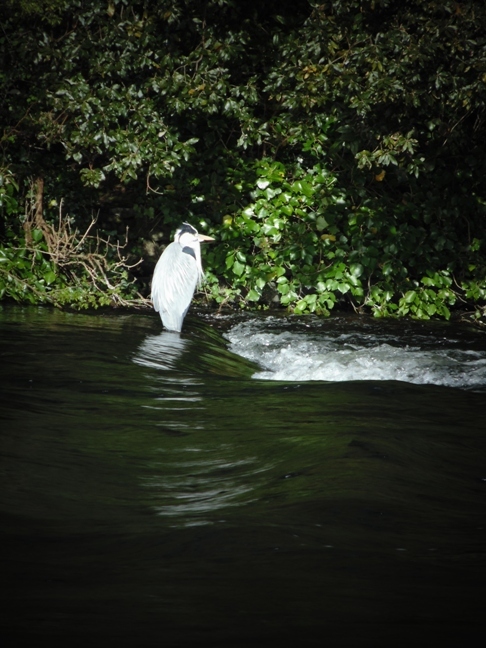 It's a grey heron (Ardea cinerea), a species native to temperate parts of Europe, Asia, and parts of Africa. The herons around my Georgian Bay cottage are great blue herons (Ardea herodias) — same genus, different species. What puzzled me, however, was a flower I found while exploring County Clare's Craggaunowen, a tourist site with re-creations of the various types of housing used in Ireland's past — from a Crannog or lake-dwelling from the Bronze age, to a ring fort from the 4th and 5th Centuries, to 1400s-era castle. Walking through the woodlands below the fort, I admired this blossom. Not recognizing it, but thinking it might be related to something I did, I asked the guide. 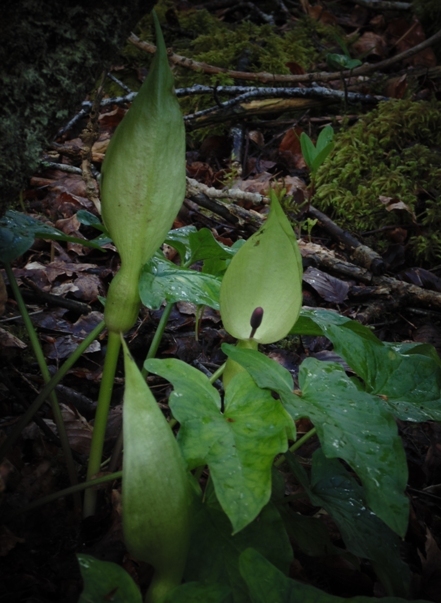 "Jack in the pulpit," she responded, "sometimes called lords-and-ladies." This is where common names can run us into trouble. To me, a jack in the pulpit is a shy blossom that covers is reproductive parts. In fact, these two jack in the pulpits belong to the same family but not the same genus or species. 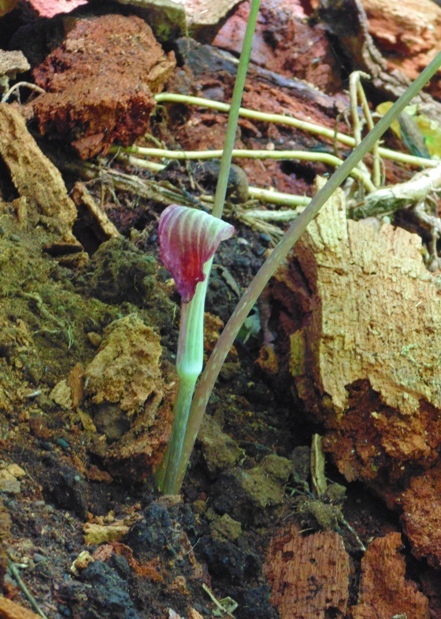 The Irish plant is Arum maculatum, a woodland species common to Europe, Turkey, and the Caucasus. Like many plants, it has a number of common names — snakeshead, adder's root, Adam and Eve, and lords-and-ladies, as well as jack in the pulpit. The Canadian plant is Arisaema triphyllum, a native of moist eastern North American woodlands. Like its Irish distant relative, this jack in the pulpit has other names, including bog onion, brown dragon, Indian turnip, and American wake robin. Common names change from locale to locale. They can provide interesting information about the use of the plant or the social history of the namer. The Latin term is unique. It identifies one genus and species, and only that one. The Best Dog-gone Study Ever! 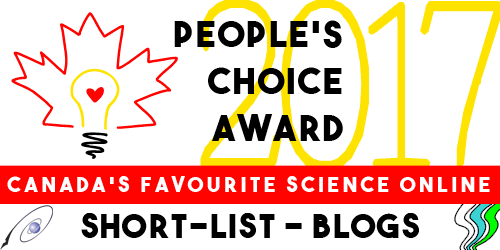 Yes, you love science too. 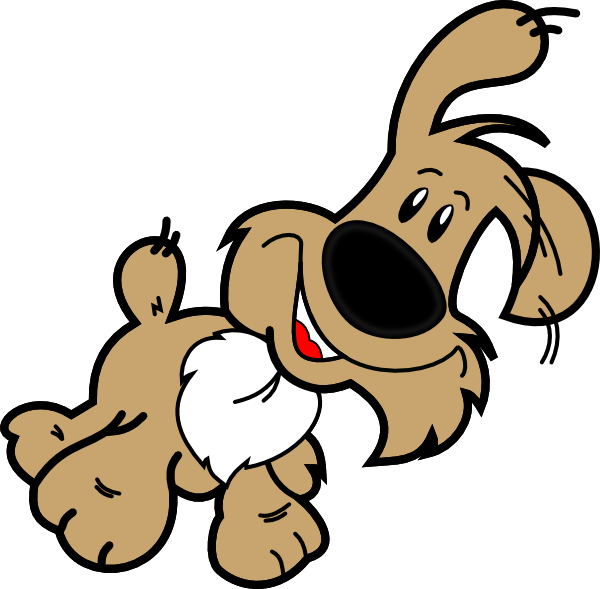 Then you will double-dog love this new Citizen Science project that you - and your dog - can participate in! It's easy - all you have to do is wait for your dog to poop. Then stoop, scoop - and mail that poop to Oregon State University. 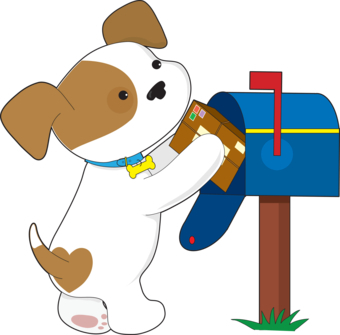 Researchers at the university would be most grateful if you mailed samples of your pet's poo to them for a study on dog microbiomes. They want to find out what's going on inside dogs' guts, and what mini-critters live in there. And the best way to figure it out is by looking at pooches' poo under the microscope. Lots of poo. So go, ahead, stoop for science! 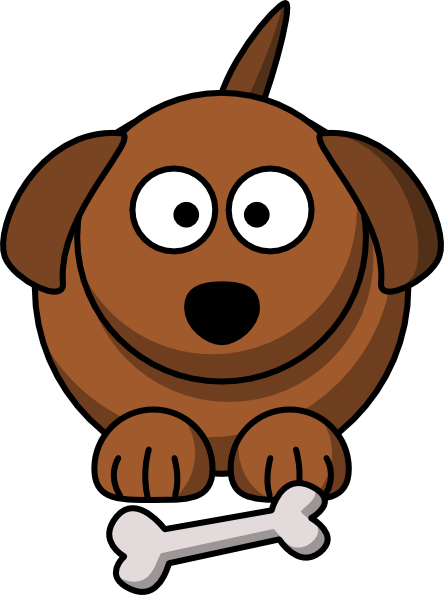 You can find all the deets on how you and your dog can enroll here. Not a fan of 'pooping a letter' in the mailbox? You can still participate in great dog-related science investigations. You'll find many other research studies, some as easy as answering a dog-related quiz, at the Dog Science Group. An ostrich is the largest bird alive today, with adults reaching sizes of over nine feet tall. 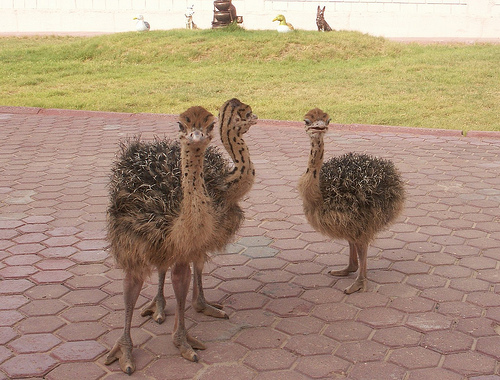 Ostrich chicks are already a foot tall -- as tall as a school ruler -- when they hatch. A wild ostrich can only be found in Africa now, although they're raised on farms in North America and around the world. Wouldn't it be wonderful to go ostrich-watching on a safari to Africa? The next best thing is an "armchair safari" though books and websites. I found out a lot about ostriches and their habits while researching my children's science book, Meet a Baby Ostrich (Lerner Group, 2015). 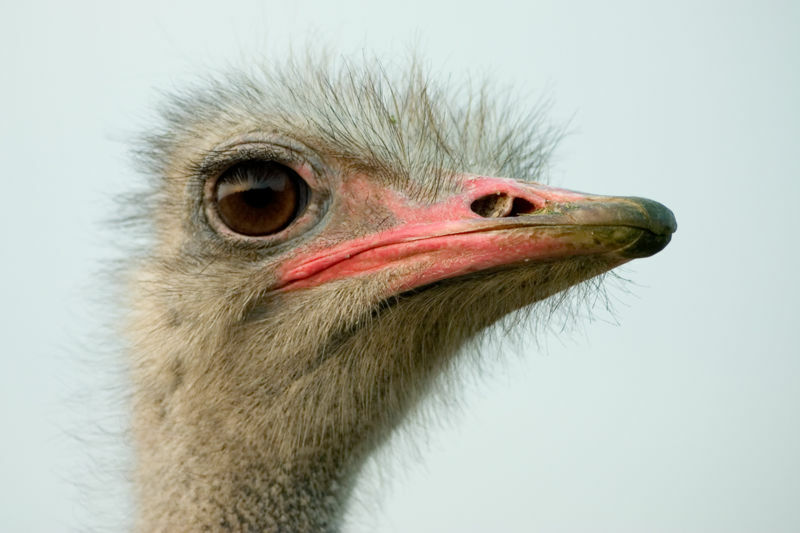 For example, an ostrich also lays the largest bird egg, averaging about seven inches long and 3.5 pounds in weight. Their large eyes are amazing, with long lashes to protect their eyes. With their keen eyesight, they're favourites at the watering hole, often warning other animals if predators are near. These flightless birds have soft feathers on their backs but bristly feathers on their necks and heads -- and their legs are bare. They're also omnivores, chowing down on seeds, shrubs, fruits, grass, insects, and even small lizards. Like most birds, they swallow pebbles to help them digest food. They can survive for several days without water. Also check out other African-related publications and websites on our Sci/Why post, "Who Wants to be a Scientist?" Marie Powell is the author of more than 30 children's books, including Dragonflies are Amazing (Scholastic Canada, 2007) and Meet a Baby Ostrich (Lerner Group, 2015).